Even the best garage door is not fully protected from damage and natural wear and tear. Although regular maintenance can help your door in many different ways, some accidents can still occur. If you're able to recognize them in time you'll be able to make sure that the problem gets addressed quickly and doesn't exacerbate. One of the most serious problems that can affect your garage door is if one (or more) of its springs break. Since these components are in charge not only of supporting the weight of the panels but also are the ones that raise and lower the door, their role is incredibly important. You'll be able to tell that a spring broke when you hear a loud BANG coming from inside your garage. If you happen to be there when it happens, you'll probably see your door slam to the ground, or jerk down wildly. Whatever you do, don't try to use the system under that condition. The entire door could collapse. Dealing with the springs is very dangerous, so you need to contact our technicians right away. There are several ways to figure out that one of your garage door lift cables snapped. The panels will usually start to tilt to one side, or - if both cables broke - won't move at all when you try to open the door. If the spring seems to be fine, then the problem is probably with the cables. If your door gets stuck while closing you could be dealing with a cable that got off the drum, and it will need to be looped back into place. This too involves dealing with spring tension and the heavy weight of the panels, so it's best if you don't try to handle the cables by yourself. 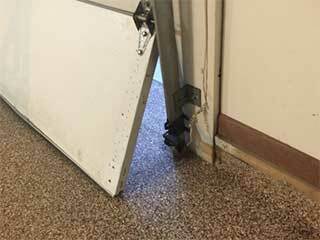 If your door starts to slow down as it opens, or ends up getting stuck, you could be looking at some track related problems. These components guide the movement of your door, so any bending or blockages will result in squeaky and noisy operation, and may even cause the door to get off track in some cases. You should make sure the tracks are properly clean on a regular basis in order to prevent this. If you find evidence of rust or bending, let our technicians know. The door rollers could also be responsible. These components travel inside the tracks and help the door move, so if they become worn they will start to squeak and popo and won't be able to work as well as they're supposed to. While the rollers can be lubricated, the tracks should not be. A lot of problems can be not only complex to handle, but also extremely dangerous. It's always better to give our experts at Garage Door Repair Dallas a call rather than risk getting hurt.